Florida Gov. 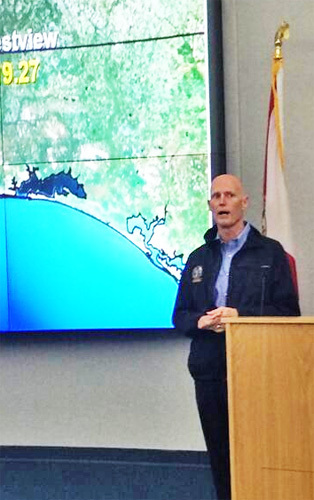 Rick Scott met with governmental leaders at the Escambia County Emergency Operations Center in Pensacola Wednesday morning. After the meeting, the governor was to tour flooded areas around Escambia County. Scott has promised that he provide the state resources needed to help the area. Pictured below: Scott, Interim Escambia County Administrator Larry Newsom and Pensacola Mayor Ashton Hayward during a briefing at the Escambia EOC. Courtesy photos for NorthEscambia.com, click to enlarge. Historic flooding and storms hit Escambia County from a portion of Cantonment south Tuesday night, claiming the life of at least one person, leaving dozens of people trapped by rising water, plunging tens of thousands into the dark, and doing millions of dollars worth of damage. Likely hundreds of people were trapped in vehicle submerged across the area or in their homes as flood waters began to rise. In the Bristol Park subdivision off County Road 97 and Highway 297A, dozens of residents were forced into their attics as water became chest-high or deeper. Firefighters from across the county worked for hours to rescue those residents, forced to use chainsaws to cut through roofs. An estimated 80 to 100 people were rescued from the subdivision. Damages to homes, businesses and public infrastructure such as roads and bridges reach well into the millions. An estimated dollar figure won’t be known for several day. Rep. Clay Ingram said early Wednesday morning that he had spoken to Gov. 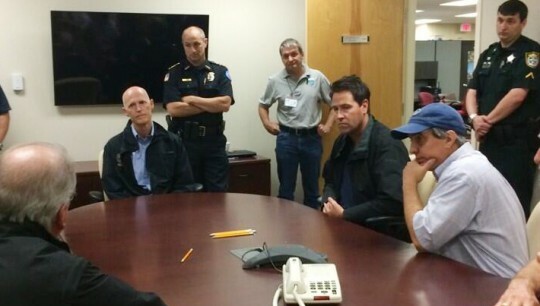 Rick Scott, with the governor promising do all he can do to help the Panhandle recover from the storm. For more reader submitted photos, click here. NorthEscambia.com will update this story and the rest of our site with the latest information throughout the day. 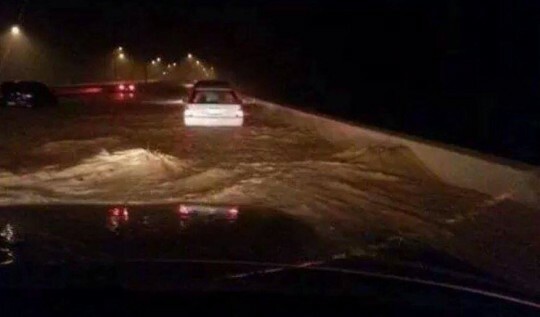 Pictured top: Rain fell so rapidly Tuesday night that the I-10 Escambia Bay Bridge flooded. 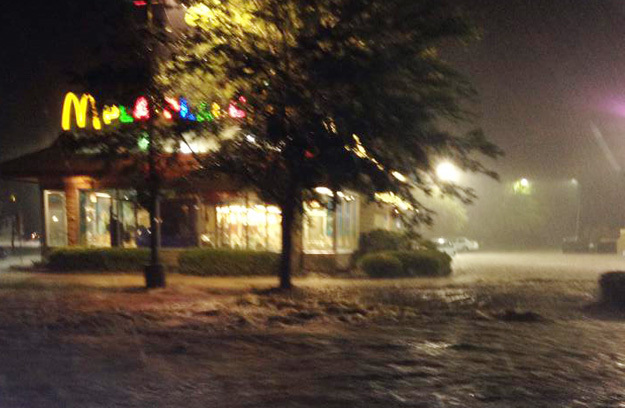 Pictured below: Flooding at McDonald’s on Highway 29 in Cantonment. NorthEscambia.com reader submitted photos, click to enlarge. Escambia County Emergency Response is still responding to calls for help as a result of this week’s flooding event. However, the call volume into the Escambia County 911 Center has fallen drastically since noon on Wednesday. Since the start of this disaster event Tuesday evening, Escambia County has responded to 281 cases while Escambia County Fire Rescue has responded to 266 cases. All total, the Escambia County 911 dispatch has received 4,129 calls between the start of the emergency at 4 p.m. Wednesday. Flood waters are receeding, but drivers are asked to avoid driving if at all possible. 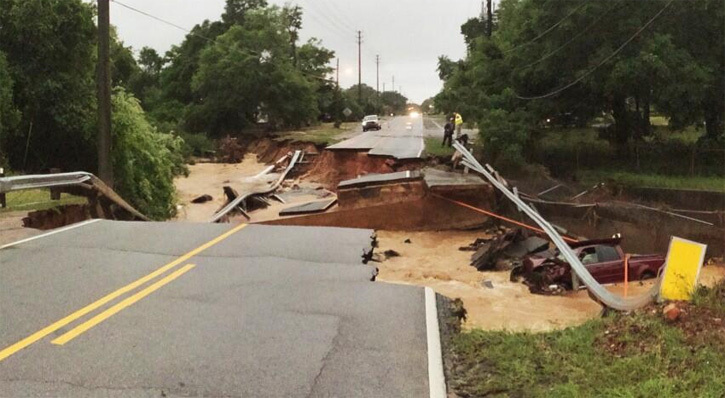 Escambia County will begin a full inspection of roads, bridges and other infrastructure early Thurday morning. Tax Collector Janet Holley is reopening three of her locations on Thursday. Deadline for paying property taxes has been extended one day until tomorrow (Thu). Payment can be made on line or drop box. Property Appraiser Chris Jones will also reopen his offices on Thursday. 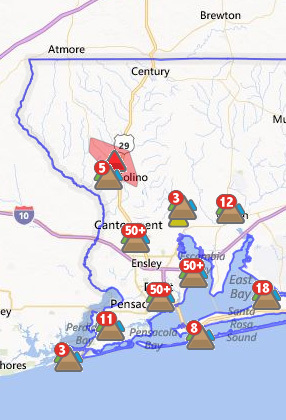 Almost 17,000 Gulf Power customers in Escambia County were without power at 3:00 a.m. Wednesday. Gulf Power Company has restored power to more than 35,000 customers as of 9 a.m. this morning. Crews resumed restoration efforts at 6 a.m. after the storms began to subside. Less than 24,000 customers are still without power, primarily in Escambia County, which was hit hard by nearly 2 feet of rain since Tuesday afternoon. Crews from Mississippi Power, a Gulf Power sister company, are en route to Northwest Florida to help the company with restoration efforts. For customers’ safety, Gulf Power offices in Escambia, Santa Rosa and Okaloosa counties will not open until 1 p.m. today. Crews could do little work overnight because of the flooded road conditions and continued storms that rolled through the area. Widespread damage to the system is still being assessed before an estimated restoration time for all customers can be determined. Gulf Power’s customers are experiencing fewer power outages than any other time in recent history. In fact, investments in the power grid have made a significant difference, improving reliability for the utility’s 436,000 customers by more than 35 percent since 2010. Gulf Power’s Online Outage map<http://outagemap.gulfpower.com/external/default.html> enables live tracking of power restoration efforts. You can access this map through the company’s new Outage App on your smartphone. Search for “Gulf Power” in iTunes or on the Google Play store to download the free app. You can also keep updated through Gulf Power’s Facebook page. Schools in Escambia and Santa Rosa counties in Florida are closed on Thursday. ECUA residential and commercial sanitation collections scheduled for Wednesday will be postponed until Thursday. Thursday’s and Friday’s collections will be made on Friday and Saturday, respectively. CIL Disability Resource Center is closed. BRACE will be represented at the EOC throughout the State of Emergency. 2-1-1 information and referral agents will work from their homes for the duration of the State of Emergency. Chain Reaction’s luncheon is cancelled for today. Manna is closed until further notice. Their building & grounds are flooded with 4 to 5 feet of water. They are unable to reach our building to assess the damage due to standing water in their parking lot. They anticipate extensive loss of equipment, vehicles & food. Have a closure or cancellation to add to this list? Email news@northescambia.com. Include your name and contact photo number (will not be published). Drivers should avoid being on the roadways, according to the Escambia County Sheriff’s Office. I-10 is open to slow moving traffic. U.S. 98 at Jaquin Road is restricted due to water on the road. Southbound I-110 at MM 3.5 (Texar Drive) is restricted due to water on the road. U.S. 29 at Tate Road is closed due to water on the road. U.S. 90 at Nine Mile Creek is closed due to water on the road. U.S. 90 at Eight Mile Creek is closed due to water on the road. State Road (S.R.) 727 (Fairfield Drive) is closed due to water on the road. Southbound U.S. 29 is restricted due to water on the road. In addition to flooding, several road and bridges sustained major damage in the flooding. Pictured above: Large portions of Scenic Highway are gone. Pictured below: Johnson Avenue near Scenic Highway. NorthEscambia.com reader submitted photos, click to enlarge. Tonight A chance of showers and thunderstorms before 7pm, then a slight chance of showers between 7pm and 1am. Mostly cloudy, with a low around 54. Southwest wind around 5 mph becoming north after midnight. Chance of precipitation is 30%. Thursday Partly sunny, with a high near 73. Northwest wind 5 to 10 mph. Thursday Night A 20 percent chance of showers. Mostly cloudy, with a low around 50. Northwest wind 5 to 10 mph. Friday Partly sunny, with a high near 75. North wind around 5 mph becoming west in the afternoon. Friday Night Partly cloudy, with a low around 47. West wind around 5 mph becoming calm after midnight. Saturday Sunny, with a high near 82. Calm wind becoming west around 5 mph in the afternoon. Saturday Night Mostly clear, with a low around 52. Southwest wind around 5 mph becoming calm in the evening. Sunday Sunny, with a high near 84. West wind around 5 mph. Sunday Night Clear, with a low around 57. Monday Sunny, with a high near 87. Monday Night Mostly clear, with a low around 58. Tuesday Mostly sunny, with a high near 86. 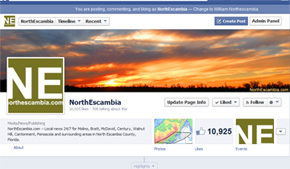 NorthEscambia.com frequently posts updates during situations like our flooding on our Facebook page and Twitter. Severe weather forced the postponement of three area softball playoff games. The Region 1-7A game between the Tate Aggies and Navarre Raiders has been moved to 7 p.m. Wednesday. The West Florida versus Tallahassee’s Florida High Regiona 1-4A game has been postponed until 6 p.m. Wednesday. The Jay Lady Royals regional semifinal playoff game against South Walton has been moved to Thursday, 2 p.m. at Jay. · According to the National Weather Service in Mobile, Santa Rosa County received an estimated 17 inches of rain in the last 30 hours. 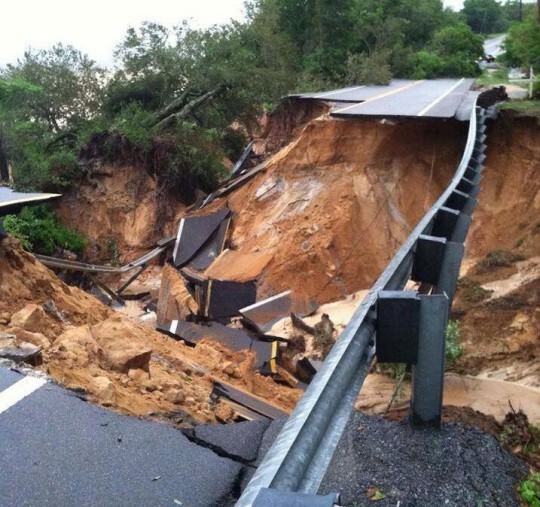 · Do not remove road barricades on closed roads or bridges. Even after the water has receded, public works crews must complete safety inspections. your questions at (850) 983-INFO or 4636. A flash flood warning has been issued for Big Coldwater Creek. The river is at minor flood stage of 10 feet and is expected to crest at 11 feet. Residents living in the lower portion of Pond Creek should monitor the water levels in their area, including water levels on the roads leading to their home. Remember conditions can change very quickly and impassable roads may prevent any necessary evacuations. The Blackwater and Yellow Rivers are not currently forecast to reach flood stage. Damage estimates for the county are not yet available. County staff are continuing to assess damages and make repairs as possible. Residents with flood damage can report damage online including submitting photos at http://santarosa.fl.gov/EmergencyNEW/WebDamage.cfm or by calling (850) 983-5360. If you have already begun repairs, be sure to take photos of the damage and keep all receipts for any repairs you make. Make sure the date is clearly visible on all receipts. · There were 94 emergency 9-1-1 calls from 8:30 p.m. April 29 to 8:30 a.m. April 30. · Sand bags are being given out from the county road & bridge department located at 6075 Old Bagdad Hwy in Milton. · The Florida National Guard is sending four high wheeled vehicles to help assist with rescues in flooded areas. Dangerous road conditions can be reported to the Santa Rosa County Road and Bridge Department at (850) 626-0191. County staff will begin to assess damages and make repairs as soon as it is light and safe to do so. The declaration of local state of emergency was signed at 10 p.m., April 29. 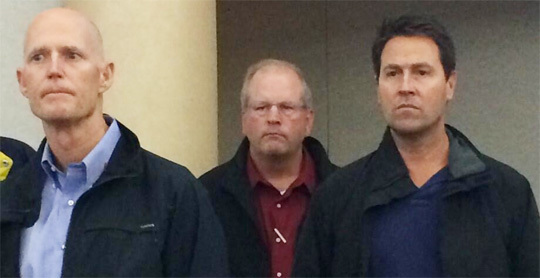 A declaration will allow the county to implement protective actions if needed. · The Santa Rosa County Emergency Operations Center is currently at a level 2 activation, or partial activation with essential personnel. · All county offices will be closed Wednesday, April 30. Essential employees are to report to work. · Courts in Santa Rosa County will be closed Wednesday, April 30. First appearances are scheduled for 1pm today at the Santa Rosa County Jail. Judge Goodman’s trial will resume at 9am on Thursday, May 1st. Jurors should plan to report at 9am. Individuals who have hearings not included in the aforementioned may contact their attorney or the Clerk of Court for rescheduling information. · Santa Rosa County Health Department will be closed Wednesday, April 30. · Santa Rosa Sheriff non-essential personnel are not expected to work Wednesday, April 30. Law enforcement officers are to report to duty. · Allied Waste / Republic Services will not be running today. All customers will be serviced one day later than scheduled. In the City of Breeze, yard waste will be collected on Saturday and we will run as scheduled Thursday and Friday. Those needing transportation to the shelter can call (850) 983-INFO or 4626. The Santa Rosa County School District has canceled school for Wednesday, April 30 due to unsafe road conditions. Due to severe weather conditions, all Pensacola State College campuses and centers will be closed Wednesday, April 30. This includes all classes, events, and campus activities. Due to severe weather conditions, all University of West Florida campuses will be closed tomorrow, Wednesday, April 30. This includes all classes, events, campus activities and online courses. Additional information regarding events and classes will be released as soon as it is available. · Road block at Avalon Blvd. · The west end of East Bay Boulevard near Cedar Street in Navarre. The detour for those east of Cedar is Bergren Road. · Broad Street, between Berry Hill Road and Madison Street in Milton. The detour is Conecuh Street. · Venetian Way in the Gulf Breeze area is close at 2640 between Gondolier Blvd and Coronado Dr.
· Sherwood Dive at Codell Street in Holley By The Sea is closed due to damage. The detour will be around the block. · County-wide road flooding on smaller streets continues, and in some areas will take some time to recede. Standing water creates a serious road hazard including road damage that may not be visible. Additionally, the wake from passing cars can cause the homes on the street greater flooding. Please use care/find alternative routes to flooded road ways. One person was transported and released from Gulf Breeze Hospital after getting caught in the water from the flooding. Six campers stranded at the KOA Campgrounds, 8700 Gulf Pines Drive in Milton. They are being transported to the Milton Community Center Shelter. Residents on Ranchette Square, Larker Woods, Green Brier and Gueseman in south Santa Rosa were rescued via Zodiacs by Midway Fire District. Water drainage and sewer pumping systems have been overwhelmed. Whether you are on septic tank or sewer system, please avoid flushing toilets until the situation improves. If your septic tank has been flooded, it is likely that your toilets will not flush. Flushing may cause the untreated sewage to back-up into your home. It is safest to wait until the water recedes before trying to flush toilets. Depending on the amount of flooding or damage to your system, you may need to have a professional repair or servicing once the water recedes and the ground is less saturated.